What makes a flower beautiful? Is it the bright, attractive colors or the wonderful fragrance or the very tenderness of those petals? The same perplexity befalls us when we try to describe the Bhagvat Katha that took place in Houston. What was that blissful, harmonious beauty all about…was it due to the venue which was the Shri Radha Krishna Temple that stood on the busy Beechnut Street in the heart of the city, where the glorious deities of Lord Rama along with Sita Devi, Lakshmana and Hanumanji and that of Lord Krishna with Radha Ma stood right next to each other in such splendor as though they had come down from Vaikunta themselves to partake of the Katha or was it the grace of the Guru that manifested as the divine nectar of the Katha out of Poojya Poornimaji? Organized by Global Organization for Divinity, the Maha Yagna was scheduled between November 22nd and 28th. This actually proved to be a trial period for the devotees as it was the Thanksgiving holiday season in the United States. 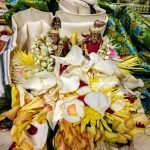 The devotees had a choice to make as to whether to use this as an ideal opportunity to attend the Katha or to use this as an excuse as they had to go away on holidays. Glory be to our Divine God, the Mandir was flooded with devotees during the saptah as they won over the trial or, to be more apt, the Leela of Lord Krishna! The peak count of devotees rose upto 270 and more. Yet another highlight of the event was the presence of Sri Sri Swamiji’s devotees from the different corners of the country to attend this Maha Yagna. Devotees from states like Florida, Massachusetts, Illinois, Seattle and California participated, in addition to devotees from other parts of Texas. The most blessed aspect of the Bhagavata Saptaha Maha Yagna was the fact that our beloved Sri Swamiji’s Holy Padukas which is no different from Him, arrived in Houston to grace the Yagna, thereby sanctifying not just the Katha but the entire Houston area. 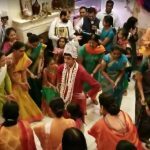 Every day, the Katha was preceeded by a concert session that comprised of Bhajans and classical music for about an hour which was performed by the artists fron Houston and bhajan groups from other temples. Sisters Keerthana & Kruthi Bhat (students of Swaralayam Arts Forum), Sri Govindaji of Gaudiya Math, Namadwaar devotees, Srimati Vyjayanthi Vivek, devotees from the Sanatan Hindu Center, Lakshmi Narayan Mandir and the Banke Bihari Parivar performed the Bhajans on the seven days respectively. The artists were honored as also those who were supporting the cause of Sanathana Dharma in the Houston area. A souvenir was released to commemorate the Maha Yagna. As devotees entered the temple, they were given a copy of the souvenir. This souvenir was truly as treasure to possess! It contained the divine message of Swamiji in addition to all Kirtans, Bhajans and Dhyana Slokas from Srimad Bhagavatam. ” Gopika jIvana smaraNam ! GovindA ! GovindA! Maharaj Parikshit who had been cursed knew that he had only 7 days to live and had resorted to listening to Srimad Bhagavatam from the lips of Sage Shuka as his only means to liberation. Whose heart wouldn’t melt when this scene is heard as Poornimaji narrated and pictured in the mind? But it takes seconds before we realize as to how better off Maharaj Parikshit was in comparison to our fragile situation where we do not have slightest clue as to what would happen to us the very next moment. On that accord should we not be listening to Bhagavatam as our refuge and fort of strength and comfort from this very second? 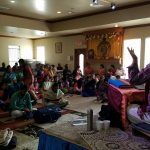 Poojya Poornimaji’s rendering all the great chartitras of great Bhagavatas to the devotees of Houston stirred up something immense and infinite from deep within the weary souls. Day One of the Katha comprised of Poojya Poornimaji talking on the Bhagavata Mahatmiyam. Naradha charitra followed on the second day .The discourse on the Charitras of the great Bhagavatas Dhruv and Prahlada invoked devotion in the hearts of all those who lent their ears and mind to it. relief from pain) or ‘arthaarthi’ (those seeking for more wealth), when we seek the Lord as our resource His grace and compassion fulfills all our requested needs and even more. Lord Krishna’s form is described in one of the slokas as “vyatyastha padam vanamAladhArinam’ Just as that garland made out of a combination of beautiful wild flowers, the Bhagavata Maha Yagna was a combination of Poornimaji’s soul stirring discourse and melodious bhajans. Indeed it was a feast for the ears. It was insightful and enriching to listen to Poornimaji’s explaining of how Bhakti Devi pleaded to Narada to revive her two sons Jnana and Vairagya who were old and weak in the Kaliyug. She explained in layman’s terms as to how when the devotion within is awakened, Jnana and Vairagya naturally come along, just as two kids tracking steps behind their mother, while, on the contrary if one has only Jnana and Vairaghya…and is devoid of Bhakti, it is of no value. Blessed were we to listen to the Krishna Leela. It was, by itself a Leela of Krishna! While Krishna Avatar was supposed to be spoken of on the sixth day of the Saptah, due to time constraints, the day ended with the narration of Charitras of Gajendra Moksha, Amrutha Mathan and Vamana Avatar. The moment Poornimaji said that Krishna Leela could be narrated only on the seventh day, which is the last day of the Saptah, all our eyes were filled in dismay and disbelief that we again were in pretty much the same critical state that Maharaj Parikshit was put in when Sage Shuka did not talk on Krishna Leela for a long time within his predicted 7 day time frame. Poornimaji descriptively explained as to how humbly & cautiously Maharaj Parikshit requested Sage Shuka to narrate Krishna Katha in extensive detail explaining that he had been waiting there without consuming food or a drop of water just in anticipation of this Krishna Katha. Maharaj Parikshit prayed to Sage Shuka to please bestow mercy on him by narrating Krishna Leela . We all went back that day totally experiencing the same yearning as that of Maharaj Parikshit and returned the following day in great eagerness and anticipation to listen to Krishna Katha! Every one were filled with joy and awe during the entire narration of Krishna Katha, and all those elating Bhajans especially the bhajan “Brindavan mein Khunjbhavan mein naachat Giridhar Lal” along with that discourse made one want to dance in divine ecstasy. Devotees Sujathaji Nishaji, Zenithaji and Geethaji provided vocal support for the Bhajans while Dexterji was in charge of the tabla and a young talent junior Varun handled the harmonium. As a part of the everyday routine, the discourse concluded with a ‘Prayoga Sloka’ and the ‘Kirtan of the day’. Poornimaji taught important slokas from Srimad Bhagavatam to the assembled devotees, one sloka a day, which everyone sincerely repeated and learnt. The ‘Kirtan of the Day’ was a chosen Kirtan of Sri Swamiji which Poornimaji sang and everyone enthusiastically sang along. While the ears heart and mind were fed with such a wonderful feast, can the stomachs be left out? Every day, dinner prashad was served to all the devotees by volunteers with welcoming smiles on their faces and warmth in their hearts. During the Katha, at least on 3 days, there were multimedia presentations on Sri Swamiji, His principles, teachings and activities in India and abroad. On the last day, a precise and concise presentation of the concept of Nama Dwaar was done by Tejas Dave. After the last day’s discourse, Poornimaji explained the importance of the Sangraha Parayana (consisting 68 slokas), reciting which one attains the same merits of reciting the entire Srimad Bhagavatam. Everyone recited the Sangraha following Poornimaji. On the last day, a mass prayer with Mahamantra Kirtan was performed after the Katha. Devotees wrote their prayers into a prayer box, placed in front of Sri Krishna and Sri Swamiji’s portraits, and chanted the Mahamantra. Then came the grand finale – the Dandiya Raas dance. One cannot help recounting the enthusiasm exhibited by the elderly during the dance – for the devotional Kirtan “Kaliyayum Balikollum” composed by our beloved Shri Swamiji signifying the glory of Mahamantra. All devotees rejoiced in their dance. At the end of the last day’s Katha, a few devotees stepped up to talk about their blissful anubhava, which inturn inspired many other devotees into realizing the value of Namakirtan and grace of our Divine Lord & our beloved Shri Swamiji. Shri Jeevan, Shri Subhash and Mrs. Zenitha Mani were a few who recounted their experiences. Later, devotees stood queued up in a line with utmost reverence and devotion to receive the Mahamantra CD and Kumkum Prasad given away by Poojya Poornimaji. Listening to the glories of the Lord from the lips of Poojya Poornimaji was a truly divine experience that only those who attended it would appreciate. However, that was not all. Every day of the Saptah was filled with activities that focused only on the Lord and nothing else and those who had been part of the events throughout the day felt the true import of Bhagavata Dharma. perform Srimad Bhagavata Parayana individually! The day ended with dolotsav (putting the Lord to sleep). 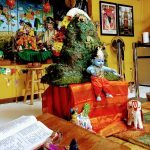 A special Divya Nama Sankirtan was performed on Thanksgiving day – Thursday, the 27th at 10:00 pm. Karthik Bhagavata, Sri Swamiji’s ardent devotee who came from Ohio, led the Divya Nama Sankirtan which went on for 3 hours. 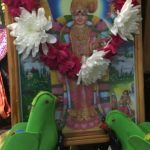 A small deity of Lord baby Krishna in cradle was put in the middle of a hall and all the male devotees went around in circles singing glories of Lord and many wonderful kirtans of Shri Swamiji were also sung. Bhajans and Kirtans were ringing in the air and filled the entire space with such divine ambience. After the Gopika Geetham during the DivyaNama Kirtan, the male Bhagavatas danced for a few Raasa songs of Sri Swamiji. Following that, the womenfolk of the satsang gathered to perform a beautiful ‘kolattam’ of the ‘Kaliyayum Bali Kollum’ song. The whole experience was one that could be called as heaven on earth. On the last two days, Ashtapadi (Geetha Govindam of Sri Jayadeva) was sung in Sampradaya (traditional) Bhajan style and ‘Radha Kalyanam’ (Radha-Krishna Vivah) was performed after that. All those who attended the Bhagavata Maha Yagna for all the seven days, were surprised that the seven days passed by so quickly! All the devotees were heavy at heart out of their longing for wanting to have more of such divine experience. How could one not have such a longing after having tasted the divine nectar of Srimad Bhagavatam? At the end of her discourse, Poojya Poornimaji blessed everyone present there with her prayers and concluded her talk with a promise of having a Namadwaar being established soon in Houston by the grace of Lord Krishna and Sri Swamiji, where we would have incessant Nama Kirtan. The Lord and Sadguru were extremely pleased with the Bhagavata Maha Yagna. In indication of the same, soon after the Bhagavata Katha ended on the seventh day, a fresh shower of rain poured, wetting the grass. Truly, they have showered their choicest blessings on one and all. In a way the rain shower also quenched the hearts of devotees of their longing and everyone left with a contentment of a fulfilled promise of Shri Swamiji’s blessings, only waiting for another 358 more days to pass!